Eco or green vacations are popular and an excellent idea, but they can be expensive and sometimes intimidating to sort out on a budget in a foreign country. We've tried our hand at a few different green trips since coming to Japan, and have learned a great deal in the past year. (We lean toward cheap and green in life in general, so we automatically transferred these same concepts to trip planning.) Also, we often find that inexpensive travel is much more interesting, green, and adventurous than something with a high price tag. Our first green vacation was helping rethatch a roof in Nagano Prefecture, followed by camping in Hokkaido, and then WOOFing on Shikouku Island. Each was a little different than the last - a guided volunteer trip to farm labor - but all were fun and fantastic learning experiences. We do tend to take the slow route, get dirty, lost, and eat at places where we can't quite read the menu or exactly understand what the cook is telling us, but we love it! With a bit of a lull in activity at the farm and the university, we decided to visit the Fuji Five Lakes, specifically Kawaguchiko. As one of the main tourist destinations always discussed, we thought an exploratory trip for future visitors would be a good idea. The bus ride was short (under two hours) and direct. The climbing season for Mount Fuji won't open until July, and we assumed it wouldn't be super bustling. Plus, some friends highly recommended the local specialty - houtou (pronounced hoe-toe) udon - if we went, and that pretty much sealed the deal. With our mouths already watering, we hit the road. We looked for a locally owned hostel that would let us cook a meal or two and offered morning coffee. A grocery store just up the road was an added bonus, and we noticed a number of fruit stands that would allow for rich foraging of locally grown fruits and vegetables once the season got rolling. A wonderful feature of Yamanashi Prefecture are the abundance of wineries, which made for an excellent beverage selection. Another advantage of this hostel was an option to rent bicycles. Bicycles are one of the best ways to do an overview of an area and get farther afield cheaply and quickly than is possible on foot. Stopping for a picture, examining something more closely, exploring a roadside shrine, or pausing for a snack is easy on a bike. Faster than on foot but still able to interact with people and the place, we can't recommend this kind of travel enough. We also liked that the hostel encouraged energy conservation through signs, staff behavior, and good use of fluorescent lightbulbs and motion sensitive lights. Recycling and garbage sorting were also de-rigueur. - Choose locally owned hostels, hotels, and restaurants. Sure, the food at the chain is well-known and cheap, but it's not doing much for the local economy. We often ask hostel staff or grocery store clerks where they eat, which results in great places a bit off the map and in a good price range. Supporting local economies is good, responsible tourism and often results in a highly satisfied tummy as well. - Look for seasonal foods and specialties of the area. This goes hand in hand with choosing local businesses - area farms and orchards are about as local as one can get - and supporting a local sake brewery or winery really isn't that difficult, is it? - Visit local museums and natural points of interest. Doing both of these augments an understanding of the place you are visiting and the culture indigenous to it. Find out what's special about where you are and celebrate it. - Use eco-friendly transportation whenever possible. We often move about on foot, bicycle, bus, or train (and once by ferry!) when traveling here in Japan. Flying is a big carbon and fuel sponge, so look for a means of getting about with a smaller footprint. More often than not the slower (and usually cheaper options) afford a more intimate view and experience of the place. - Consider taking your own chopsticks. Not a bad idea for everyday anyway, but on vacation these can be a lifesaver. When getting bento from the supermarket or eating at a local restaurant, you're more than ready when the dish arrives. Plus, it saves on trees! - Stay at a place where you can do a little cooking. Popular in America now, food tourism is also part of the fun in Japan. but if you're traveling on a tight budget, check out the offerings in the local supermarket. If a guided tour is really your thing, then check out One Life Japan (the organization we went with for the thatched roof project) for tailor-made biking, camping, and hiking adventures that are breathtaking. 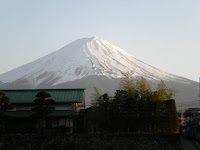 Check out the list of offerings for Japan at Responsible Travel. Responsible Travel also offers some very thoughtful articles about what it means to travel responsibly as well as a handy check list. For even more information about eco-tourism options in Japan, visit Ecotour Comprehensive. The Guardian UK green travel website offers a compendium of resources and listings not only for England but the world over for green travel. It also includes all types of travel and accommodations, information on what to look for, and ideas for making your own green trips. Thanks Joan, for the mention. And anyone who wants to help with the rice this year - get in touch! Thanks for reading, Kevin, and I'll be sure to add that helpful note at the end of the series. Looking forward to the rice planting! A sure sign of spring.